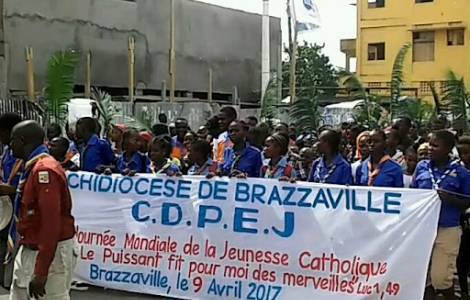 Brazzaville (Agenzia Fides) - “Congolese youth and Christian identity ”, was the theme of the 47th Plenary Assembly of the Catholic Bishops Conference of Congo held 26 November to 2 December at the Inter-diocesan Centre Œuvres (CIO), in Brazzaville. The theme recalls the XV General Ordinary Assembly of the Synod of Bishops, “Youth, Faith and Vocation Discernment ”, held in Rome in October, says the message issued at the end of the Congolese Bishops’ plenary. “Several reasons led us to choose this theme” says the final message, sent to Fides. “”From the demographic point of view the population is young 60 - 70% of the population consists of young people. From the socio-cultural point of view, although youth forms the most numerous social group, it is paradoxically emarginated, rendered vulnerable and sacrificed, victim of the evils in our society : unemployment, delinquency, banditry , scorn, isolation, exclusion”. From the religious point of view the Bishops are concerned that “young people are disorientate by ideologies diffused by various religious and esoteric movements which manipulate, misdirect and fanaticise youth to pursue undeclared interests. In this situation many are perplexed, even disturbed questioning their faith and their Christian identity”.